Questions question our understanding of concepts, situations and ideas. There is no question about this. Kinzom Khampa, English language teacher at GIC, Pujar Gaon, Uttarkashi, did not have to read heavy academic research papers to reach this conclusion. Armed with the passion to make her children proficient not only in English language but in all subjects in and outside school, Kinzom quickly realized the power of questions. The children in Kinzom’s class were used to rote memorization and Kinzom’s initial euphoria, in the first few weeks of the academic session, about how well the children were responding to the lessons, turned into despair when she realized that they did not understand the meanings, usages and application of simple words in the lessons. She also realized that the textbook was merely a tool, and that too not a perfect one, for getting the process of learning going. She then started experimenting in her classroom. She closed the textbook and asked the bewildered children to do the same. Each lesson in the textbook is just a pointer to a theme, thought or idea. Once the core idea gets disseminated amongst and internalized by the children, everything falls into place. And this was where Kinzom started from. She started discussing all sorts of subjects, ideas and thoughts in the classroom. Of course, it took her sometime to prod the children to think but once she got them to wear and use the thinking cap, conversations flowed and ideas blossomed. The children were not really used to talking with their teachers. They were used to being talked to but had not really been heard before. Here, Kinzom began her academic year with the curriculum of talk. Once the children got comfortable voicing their thoughts, Kinzom started the game of questions. She introduced a topic, a discussion was generated, thoughts solidified and then those thoughts were questioned. She was also aware that thoughts need to be questioned very gently otherwise it would be easy for the children to retreat into their cocoons. She could not afford that if she wanted them to think critically. So, a whole week or a whole month was dedicated to careful selection of questions related to a particular discussion. This discussion would ultimately lead to the core ideas behind the lessons in the textbook. This meant that before the children got to the lessons, they were armed with a logical understanding, of the topic, which had withstood a barrage of cleverly thought out questions. Slowly, Kinzom realized that she had chanced upon a powerful weapon in her repertoire of questions. She also realized that closed questions with a simple yes or no for an answer, as is the norm in the textbooks, were not conducive to understanding. They were only encouraging learning by rote and she was not going to let that happen. She painstakingly created a list of her own questions for each lesson. Questions which tested the understanding of the child. Questions which encouraged the child to think beyond the lesson. Questions which linked the lesson to the children’s contexts. Question marks became friendly for the first time. Moreover, she made the questions easy at first then they got to different levels of difficulty. This also put a demand on the cognitive ability of the students. Unknown to her, Kinzom was actually working according to Blooms Taxonomy. She was trying to equip children with tools of knowledge, comprehension, application, analysis, synthesis and evaluation. In all this, Kinzom is clear that once her children understand the lessons, they will also be able to read (understanding the meaning), write (originally) and speak (without hesitation) in English. She believes that questions have been able to foster critical thinking skills, better communication skills, enhance creativity in her children besides making them good listeners and this is evident in her classroom where the children converse with confidence and are not fearful of asking questions. Kinzom might not be able to finish her syllabus on time all the time, but she knows that her children will know how to question things rationally and that is the biggest reward for her. 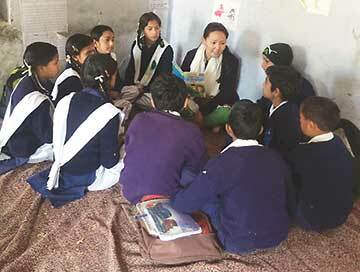 The author works with the Azim Premji Foundation as an English Resource person for Uttarkashi district. She can be reached at shree.kuriyal@azimpremjifoundation.org.